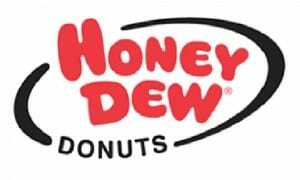 The Joe Andruzzi Foundation (JAF) and Honey Dew Donuts are teaming up on Monday, September 28, 2015 with free cups of joe and donuts in anticipation of National Coffee Day on Tuesday. Three-time Super Bowl Champion and cancer survivor Joe Andruzzi will play barista on Monday morning from 10am to 11:30am on the Rose Kennedy Greenway, at the corner of Atlantic and State Street at the Honey Dew Mobile Truck. This free event is the kick off for the second consecutive year that Honey Dew Donuts and JAF have teamed up to support New England Cancer patients and their families. For more information, please head here. Will you be grabbing free coffee and donuts on Monday morning from Honey Dew and Joe Andruzzi? Don’t forget to check the blog tomorrow for a roundup of all the great free coffee deals for National Coffee Day on Tuesday!